3 year old Shaelee shares a video review of the dog dental treats Greenies. Blue Belle waits while we talk with Shaelee about the dog treats, Greenies. Shaelee is wearing gloves because she is allergic to dogs. 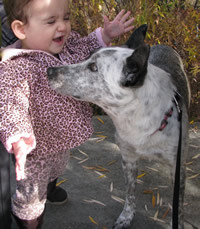 Blue Belle is the same age as Shaelee and we love the fact that Blue Belle is so gentle with her. We were not too thrilled when we realized that Shaelee is allergic to dogs, but we figured out how she can still enjoy being with Grandma and Grandpa and our dog Blue Belle. When we adopted Blue Belle we tested her people skills. She was so very gentle when we played with her and when we gave her a treat. We wanted to make sure that our new forever dog would be a good fit for our family, including our one year old granddaughter. We were really excited to have the opportunity to review greenies, they have been a favorite of our family for years. It doesn’t take long for Blue Belle to gobble up a greenie, but I do think they are in her mouth and teeth long enough to freshen her breath. We received a 12 pack of grain free Greenies from Chewy.com. They arrived packaged in a box, the mail man brought them to our door. Greenies say they are the total oral health solution. Blue Belle does likes the taste, and we are glad that they are low in calories and fat. An interesting fact that I wasn’t aware of – they have added vitamins and minerals. Key to us, they are Made in the USA! Shaelee, Blue Belle, Murry and Julie all recommend Greenies Dental Treats. We are not engineers here in the Walton household, but we do have a dog who would love this smart design. Belle loves to fetch a tennis ball, that is her favorite game. I was watching this video, laughing with glee, and Blue Belle noticed. She immediately brought me a ball. Have you ever wondered what your dog is trying to say to you? This guy took the question beyond wondering. Can you believe he even involved a cat in this tease. Watch the YouTube Video of the Ultimate Dog Tease.